"Behind The Image - Vol 2"
After the release of the first volume in this series of Behind The Image books, the next instalment was highly anticipated and eagerly awaited by fans. And they certainly won’t be disappointed. Volume 2 – "Welcome To His World" is even more impressive than the first publication. Muhammad Ali "the Elvis Of Boxing" Dies Aged 74: Muhammad Ali, the three-time world heavyweight boxing champion who helped define his turbulent times as the most charismatic and controversial sports figure of the 20th century, died on Friday in a Phoenix-area hospital. He was 74. Ali, who lived in Phoenix, had suffered with Parkinson’s disease for more than 30 years. 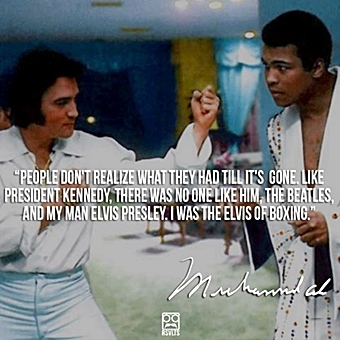 Ali was the most thrilling if not the best heavyweight ever, but he was more than the sum of his athletic gifts. An agile mind, a buoyant personality, a brash self-confidence and an evolving set of personal convictions fostered a magnetism that the ring alone could not contain. He entertained as much with his mouth as with his fists, narrating his life with a patter of inventive doggerel. a friend of Elvis' had died. While Ali's death was considerably less shocking, his departure still leaves us in a darker place. 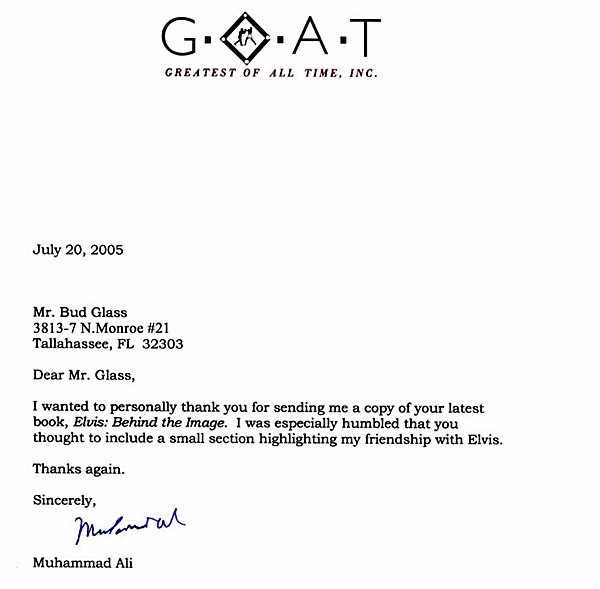 Ali said of his friend "Elvis was my close personal friend. He came to my Deer Lake training camp about two years before he died. He told us he didn't want nobody to bother us. He wanted peace and quiet and I gave him a cabin in my camp and nobody even knew it. When the cameras started watching me train, he was up on the hill sleeping in the cabin. Elvis had a robe made for me. 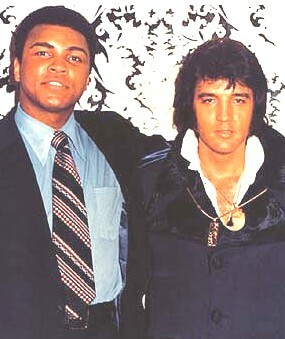 I don't admire nobody, but Elvis Presley was the sweetest, most humble and nicest man you'd want to know." At the turn of the millennium, Ali was voted man of the century, sportsman of the century, and personality of the century. He later appeared at the opening ceremony of the 2012 Olympic Games in London to a rapturous reception. A beautifully presented, hard cover book, featuring some 144 pages of high quality glossy colour & black and white photographs, this is an absolute must for Elvis fans. The front cover promises "never before seen photos" and 90% of this book is just that. 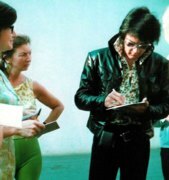 These previously unpublished rare candids are courtesy of private collections belonging to Bud Glass, Russ Howe and Sandi Miller – who once again opens up her personal journals allowing us to read of her encounters with Elvis as she experienced them over the years. 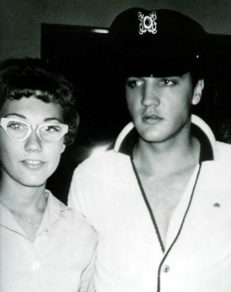 Having met Sandi several years ago, I have seen these diaries first hand – volume after volume of memoirs and keepsakes – stories that are just so enjoyable to read, and we are truly fortunate that she continues to share them with Elvis fans all over the world. In this volume we read about a time when Elvis was too embarrassed to leave his LA home due to the fact that he was nursing a huge cold sore, and spent the day pacing around the house with a tea bag on his face – promised that this would be a sure remedy!! There are endless tales of late night shooting practice at a cactus in the Las Vegas desert to rehearsals at RCA Studios in Hollywood, where Elvis decided to rehearse songs such as Only The Lonely and Soul Man- songs he had no intention of including in his shows!! 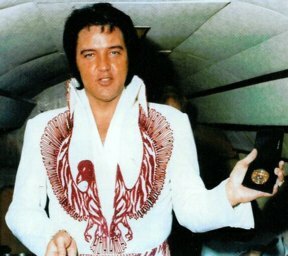 There is even a picture from a colouring book – a masterpiece Elvis created with crayons one day in September 1971 at his Hillcrest Home – when there was nothing especially interesting happening and he got a little bored so decided to colour in an Easter Egg in a colouring book. When asked if he would sign his artwork Elvis replied "Hell no!!!" and let out a loud laugh. There's even a funny story about Elvis going through the Drive Thru at Taco Bell and driving off without paying! 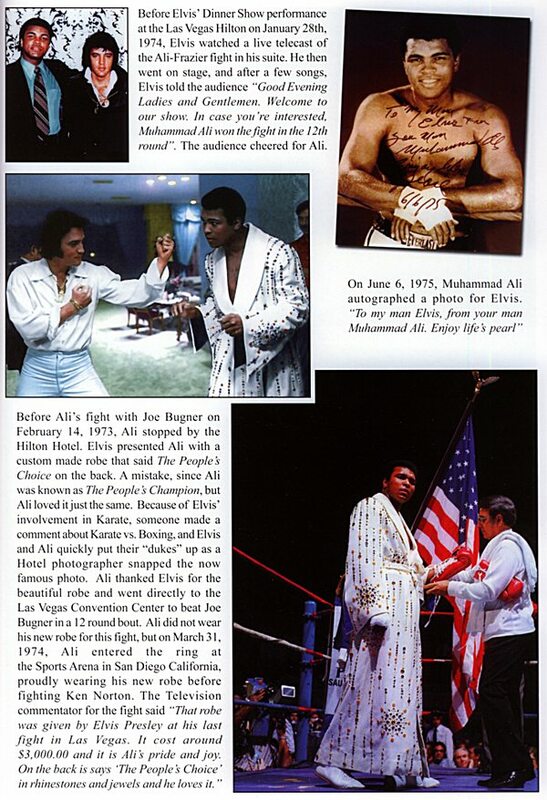 We are also thrilled by recollections from Jean-Marc Garguilo (French Fan Club), Livio Monari (Italian Fan Club) and fan Steve Toli – who all tell of their encounters with Elvis during his Las Vegas reign. There are tales of their backstage meetings along with some brilliant pictures. As far as photographs are concerned, it's just bliss from start to finish. From backstage 1950’s candids to late 70’s snapshots, this book has got every Elvis era covered. Pictures that were especially fascinating to me include rare moments such as Elvis backstage with band members of the Sweet Inspirations. Or his visit to his mother’s grave just four days before his own death. Not to mention a photograph of Elvis drawing his pistol and aiming at a mirror (snapped in 1972) – a photo that had been kept secret for over 20 years as Elvis had remarked "I want that film destroyed" once he realised a snapshot had been taken at that very moment. There are over 500 photographs of Elvis in this book, along with some rare shots of some of the people he shared his life with – pictures from bodyguard/friend Sonny West’s wedding, where Elvis served as best man. Several photos of girlfriends Ginger Alden and Linda Thompson (including a picture of her at Elvis’ funeral). 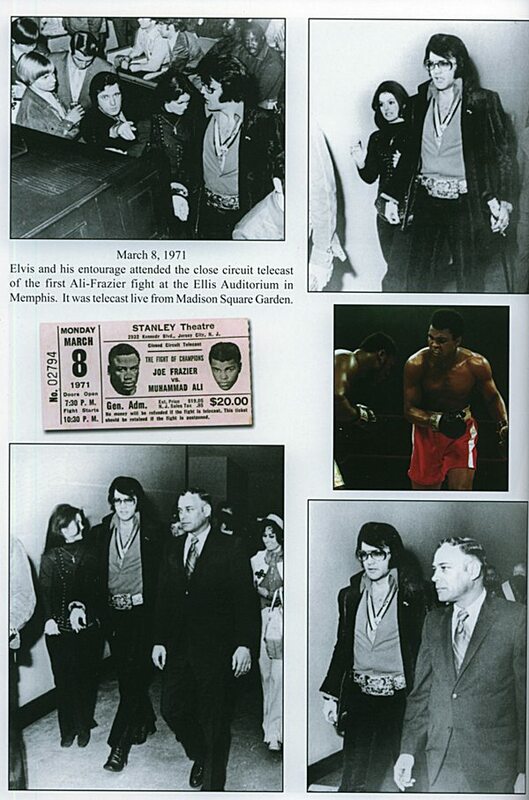 There are even some photos of celebrities who visited with Elvis at his LA homes during his time in Hollywood, such as Tom Jones, Danny Thomas, Davey Jones and Sonny Bono. And with the promise of a third instalment ("Through A Kings Eyes") – we can only wait with bated breath for yet more rare footage, photographs and material from these extraordinary collections. Verdict - As with previous DVDs (Adrenalin, Behind the Image 1 & 2) and book releases (Born to Rock and Behind The Image Vol 1) from Bud Glass Productions & Praytome Publishing – this book is of high standard quality, splendid presentation and breath-taking content. An absolute must for Elvis fans. 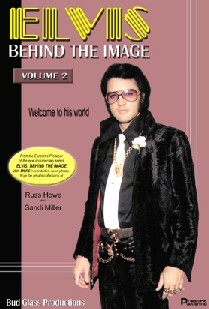 Elvis – Behind The Image Volume 2 is available for purchase from www.behindtheimage.com for $39 USD.